Yes, it’s been a long time since I posted on this blog so don’t wonder why I’m putting up some songs that have been up on some other websites for some time. When I actually heard CN Blue for the first time, I was amazed because there was at last another rock band (aside from FT Island) that broke through the usual idol obsession of Korean music. 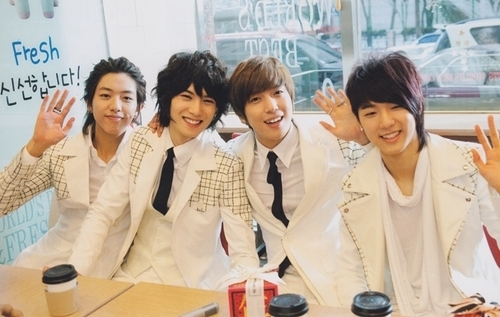 Though they still look like idols and Yong Hwa became a star because of the drama “You’re Beautiful”, they sound pretty good! They do really sound good! I am a huge fan of rock music especially when I listen to english songs and japanese songs.. and I think these guys do justice to rock, though their genre is a bit like pop rock, but they are really good. From what I’ve read (and most of their fans have read), they debuted in Japan. The Japanese music industry is good for rock bands. But in Korea, rock bands are not the usual type of music you hear, it’s mostly idol groups and hip hop. I think they have made an achievement because they did become quite popular with the song I’m a Loner — whenever I hear this song, I can’t help but say Oetoriya! geureol geomnida (ijen) ijeul geomnida (ijen) sangcheoga amul deut.. I don’t know you. I have never seen you. We never even walked pass eachother. I’m okay. I forgot everything. I’m happy with my busy life. I’ve met a great person too. Love is always like this. It fades away after some time. Can’t even remember it, Oh. # When love goes away, another love comes again. It definitely will. Even if it hurts now, it will heal a little later. It will forget. I will too. It’s not difficult. I will forget everything after today. I’m just getting used to my changed life. Oh~ No. When love goes away, another love comes again. It definitely will. Even if tears fall now, I will smile a little later. I will. I will. I will forget you. 그럴 겁니다 (이젠) 잊을 겁니다 (이젠) 상처가 아물 듯..